The media have shared a shocking story a few days ago. A small kid experienced stomach pain and his parents couldn’t determine what exactly causes this pain. However, after performing a thorough research, they have found sufficient evidence that the problems are caused by something that they couldn’t imagine to be unsafe. So, the aches and pain felt in their kid’s stomach were continuing and they wanted to detect the reason as fast as they can. At one point the father of the kid noticed a brief smell of something rotting and this smell came from their kid’s Tommee Tippee sippy cup. The father located the source of the awful smell – it was the sealed anti-leak feature from the cup. They’ve dismantled the plastic cup and found something shocking – the interior of the cup had a thick layer of mold. They were disgusted and couldn’t believe that they child was actually consuming liquids from a cup that is so dirty and dangerous. Unfortunately, the vast majority of parents don’t know that the majority of sippy cups that have detachable anti-spill parts have high chances to accumulate dirt and mold. It is very easy for these small particles and microorganisms to stay there and expand and this is especially true for those who leave the cups filled with liquid for a long time. Keep in mind that this is not something that can happen only to Tommee Tippee cups. As a matter of fact, another popular manufacturer – Sistema was heavily criticized not long ago. They have a special Twist ‘N Sip cup and several reports from different countries in the world have shown that parents have detected huge mold colonies located on the lids of the cup. According to one revolted parent, the internal parts of the Sistema cup used by his daughter were packed with bacteria. They couldn’t believe that they were actually feeding her with bacteria and mold. Eating/drinking mold can lead to many different mild and serious health problems like sore throat, stuffy nose, wheezing and/or coughing, skin irritation, eye irritation etc. 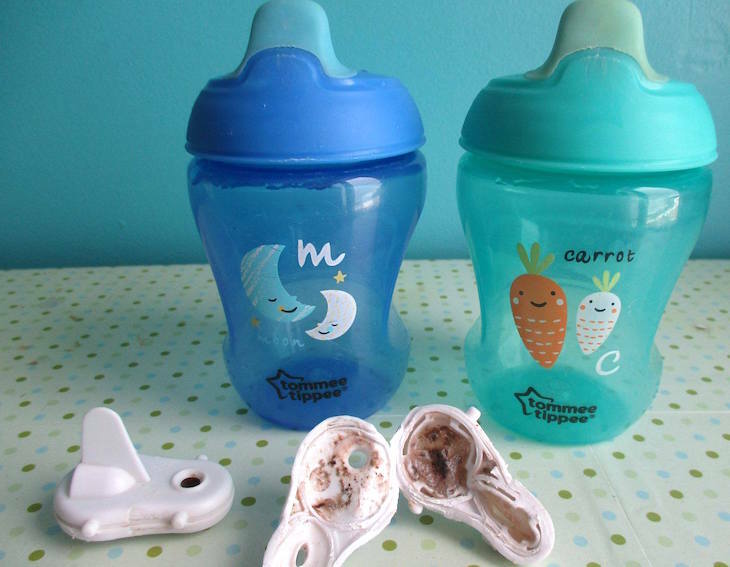 In addition, there are some parents who witnessed diarrhea, nausea, vomiting and other digestive issues in their children after using these sippy cups for a long time. Tomme Tippe has issued a statement in which they say that it is not their fault that these things happen. According to them, the use and cleaning directions they provide with each sippy cup they provide are clear and that if users follow these instructions, such incidents won’t happen. In addition, they have pointed out that when their products are used with suitable liquids, there were no reported problems. Problems appear when parents use liquids that are not advised for use in these cups. Some of these liquids that are not recommended include warm liquids, pulpy juice and thick formula milk. Finally, this reputable company advises parents to wash the cups even when they are filled with liquids because leaving them for a long time can cause problems. However, according to many parents, even those who have followed the company’s instructions can’t be sure that old won’t start expanding in the anti-spill part. One thing that each parent can do is to clean the sippy cup thoroughly or look for cups with fewer parts and better accessibility. Prior to pouring juice or milk in the cup of your kid, take some time to check the lid. In case you notice anything unusual, remove any parts that are detachable and make more thorough inspection. Don’t forget to share this information with your family, friends and coworkers because there are many people who are unaware of this problem.